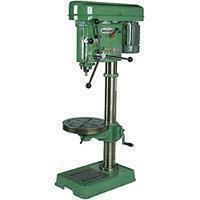 The tapping machine manufacturer, Chen Fwa, is a well-experienced supplier of manual drilling and tapping machine. Established in 1964, we are professional in precise, labor-saving, automatic drilling & tapping machinery as well as multiple spindle head equipment in Taiwan. The tapping machines are made in fine quality and has got the reputation in the industry. The operation of the machine is easy and convenient for you, because the mode is easy to switch between drilling and tapping. Besides, as a tapping machine manufacturer, the equipment can be mounted multiple spindle head to increase working efficiency for the quantity of your products, meeting the needs of the inquires. Moreover, we serve not only quality equipment, but also professional customers' service like ODM service. If you are interested in our product, please feel free and contact us today! Adopt reducing speed equipment of new type, high & low speed can be changed easily.